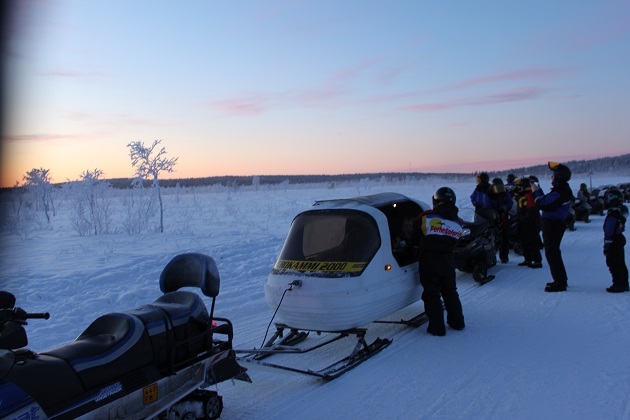 Snowmobiling is a way of life in Lapland – essential to get around and a very practical option in this snowy wilderness. For us though it was unusual and exciting and I can definitely say there is no more exhilarating way of exploring the wintery woods and landscape than on a snowmobile. 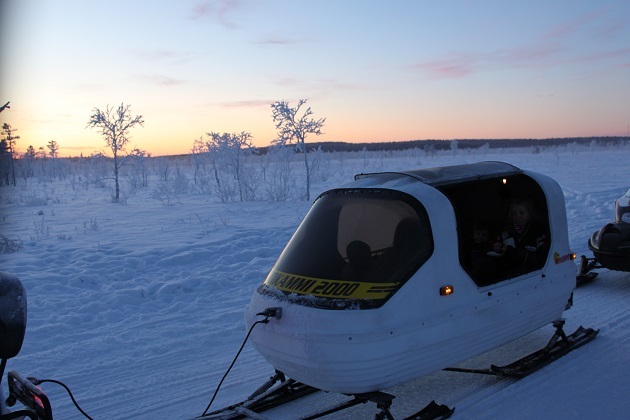 We booked our guided snow mobile tour with a local company based in Levi. Not cheap but we reasoned we couldn’t come here and not try it out. We arrived at the base already well kitted out in thermal layers and waterproof outers but gladly took their offerings of extra clothing and piled it on top. 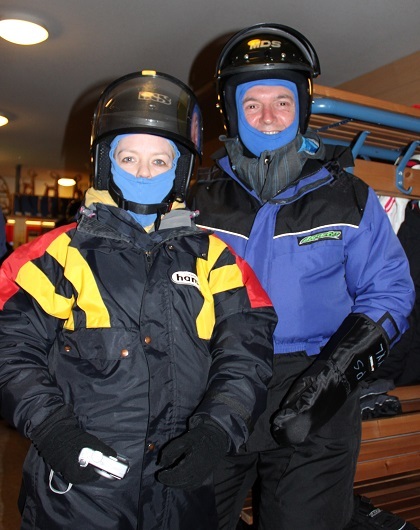 Bundled up in oversuits, helmets, gloves, balaclavas and boots we were ready to go. 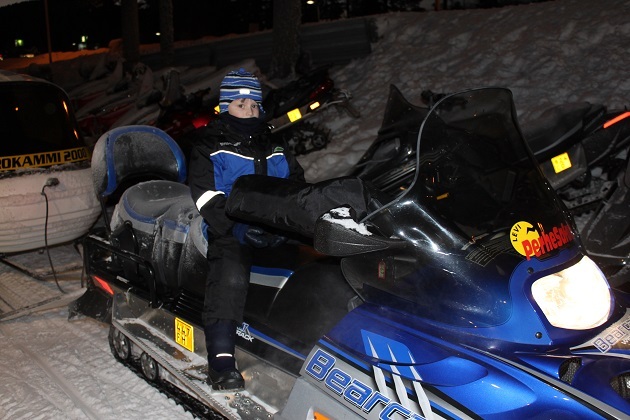 Children under ten are not allowed on the snowmobiles but can ride in a covered sleigh, towed by the guide’s snowmobile. Safe and convenient but a little bumpy at times, Son and his two new friends who rode with him loved the experience. Children under two years are not permitted to ride in the sleigh, however I would have thought, to be on the safe side they would need to be at least five. After a brief demonstration of how the machines worked and some safety information it was time to set off. We climbed onto our Arctic vehicles and hit the road or more appropriately the trail. 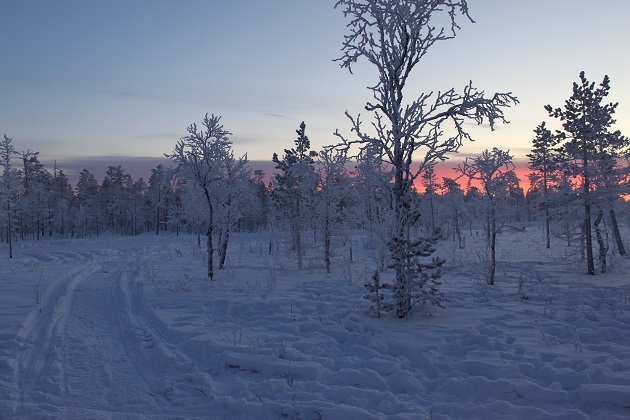 There is a whole network of carefully managed trails criss-crossing the beautiful white expanses of North West Finland. They follow forest tracks, cross frozen lakes and let you speed across snowy plains. We sped through a snow covered forest, crossed one lake and then our train of snowmobiles stopped right in the middle of another lake for about ten minutes. We watched the sun set over the forest, it was simply spectacular. Add to that the time – 1.30 pm – this was such a cool experience. 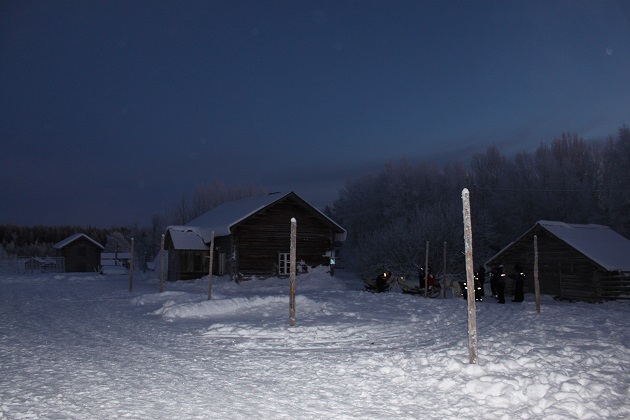 The whole snowmobile tour was 15km but at the half way point we stopped at a reindeer farm. Everyone dashed inside to warm up with coffee and doughnuts. Half an hour to explore and look around was welcomed by us. Son fed the reindeer moss, found an igloo to explore and climbed into a sleigh harnessed up to two white reindeer for a quick trip. We got chatting to the owner who told us some fascinating reindeer facts. 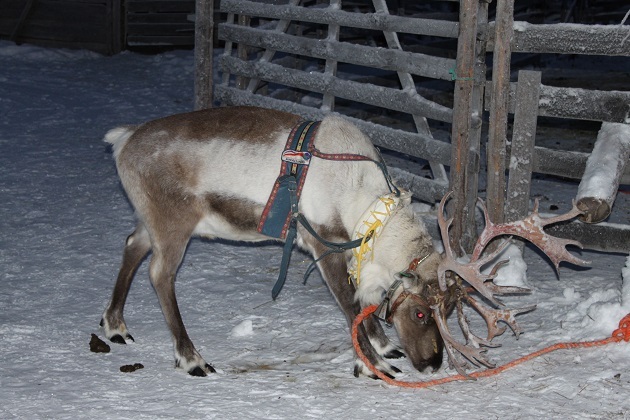 Apparently the animals pull sledges all winter – mainly for tourists – and stay in the various reindeer farms. In the summer they do not work but roam freely in the forests. Every winter, amazingly, they then make their own way back to their own farms. Every reindeer knows where it needs to go. Back on the snowmobiles and back to Levi, the return trip was speedy and more than a bit thrilling. Husband thought he was James Bond, I clung on behind for dear life as we sped and bumped across the tracks. An amazing experience, we all loved it and agreed it was an adrenaline rush from start to finish. Wow, that sounds like a spectacular day! What amazing photos too again! Beautiful! Do you remember how cold it was? It was just the most fun Erika. Don’t remember how cold it was that day, probably around minus twenty as that was the norm – also whizzing on those snowmobiles you just didn’t feel the cold – the adrenaline seemed to sort that out. That’s right! All the impressions make you forget about the temperature! What an adventure! Loads of fun Coral but really exciting too! I SO want to do this. Just need to wait 3-4 years! It’s worth the wait!! Addictive too, we are desperate to do it again. I just realized I had never seen pics of ‘real’ reindeers- out in the snow. Lovely! Wish you a great year ahead. These ones are especially cute I think – hope 2016 is a great one for you too. It was and loads of fun too. 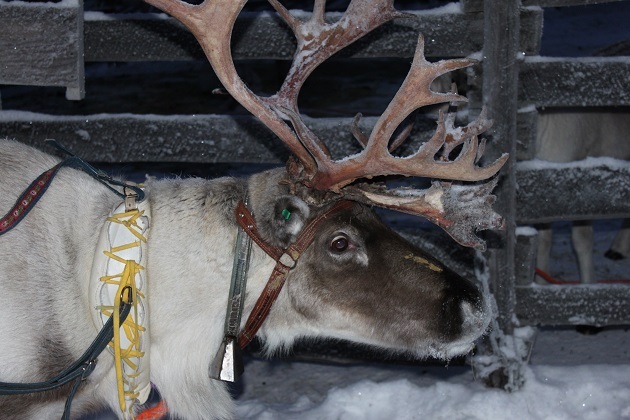 Love that about the reindeer – clever beasts! I know – who would have thought!! Yay Reindeer get summer holidays! I know, who would have guessed!! How fun! I especially like the info about the reindeer returning to their own farms. Apparently, they’re ready to get back to work after a summer vacation. Seems that way…. I wish I was ready to get back to work after our Christmas vacation, not so easy!! That sounds like you all had an amazing day Joy 🙂 And that’s a fascinating fact about the reindeer returning to each farm every winter – it shows they must be reasonably well respected and treated animals, I doubt all that many cattle in the UK would return to their respective farms, if they were given the chance to roam free!! Having said that, there are plenty of farmers who do in fact treat their livestock well, so I shouldn’t tar all of them with the same brush! 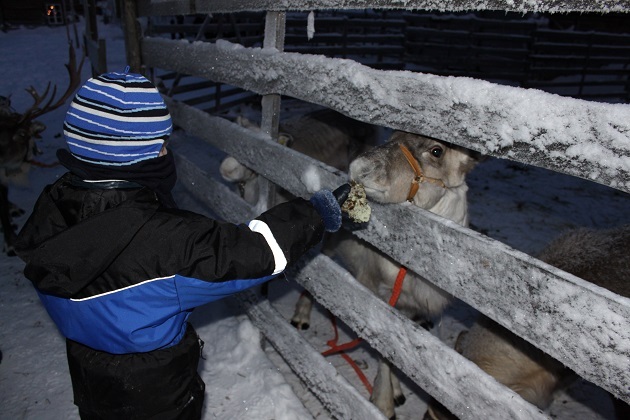 It was the most incredible day, the reindeer farm was just the icing on the cake. I was amazed they wandered all summer and made their way back – each one to the right farm as well, how clever are they!! What a fantastic experience you are having, snowmobiling seems so cool, thank you again for following and lining my blogs, take care and keep adventuring! It was such a great thing to do, would love to do it again sometime!! Loving your blog and adventures too!! It was – excitement and fun all combined! Such a great and thrilling way to spend an afternoon! I have to show my kids this. When they were little, they had a book about Donald Duck visiting Lapland with his nephew (I know, it’s a little funny), but ever since then, we’ve made references to Lapland! This is great. I think we may have had that book as well!! 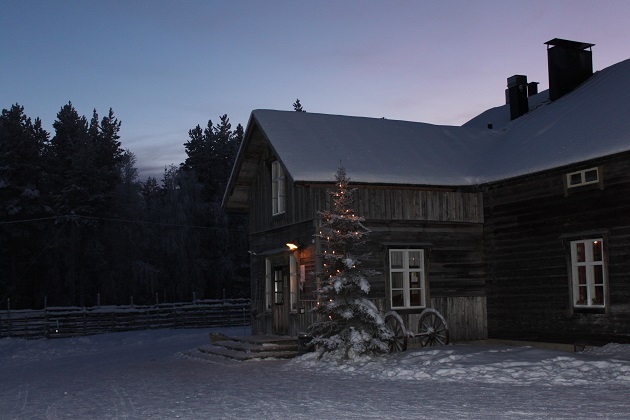 The real Lapland is incredible – I forget how Donald got on but we just loved it. It sounds fabulous and something I’m thinking of doing towards the end of the year. We had such a great time, loved every second and I would definitely recommend! Joy, loved your adventure! We have skied and snowmobiled in Colorado several times! Snowmobiling is so much fun and so glad you got to experience it! Happy New Year! It really is loads of fun Pam although I’m sure my husband thought he was James Bond and pushed it a little too much!!! Happy New Year to you too. This looks awesome! Beautiful sunset and the info. about the reindeer so interesting. I loved the trip to the reindeer farm and just chatting with the farmer was fascinating, he had a wealth of interesting reindeer stuff to tell us. The whole place is just amazing. 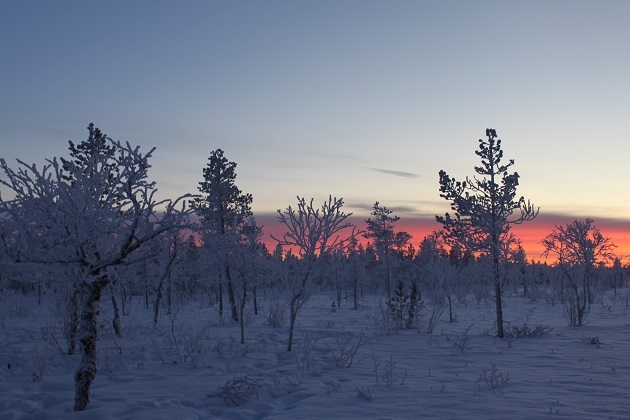 Your picture of the sunset actually makes me want to hang out in the snow. How beautiful!!! Chad and I have been seriously discussing spending some time in Lapland next Christmas season. Snowmobiling may be fun to do while we are there. Thanks for writing about this! Snowmobiling is the best way to get an adrenaline kick here!! There are so many other things to see and do though, even just playing in the snow – we loved it all!! I’m sure you would too and around Christmas time it is just magical. This is such great fun we had an absolute blast. 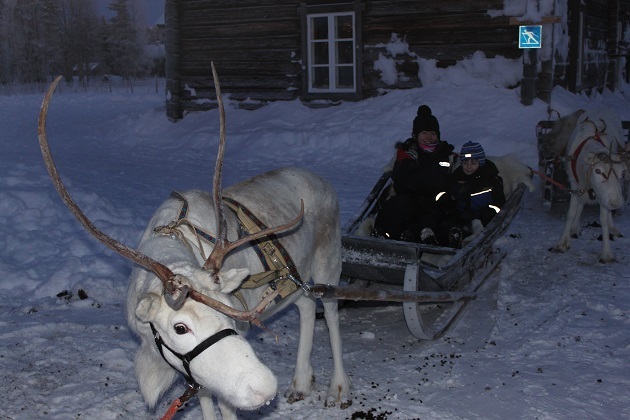 It’s even better that you can do it with kids who are still too young to ride the snowmobile – our son had loads of fun in the sleigh too. We did have that problem…. a lot – serious sleepy afternoons!! No problem on a snowmobile though, definitely gets the blood pumping!! Thank you!! This was a wonderful experience, fun and thrilling – I hope we get to do it again someday…. Oh, I loved this post, Joy! I’m a warm weather person, but I’d love to do this!! It so was!! Happy New Year to you too. I’d love to do this sometime… The countryside you’re driving through is beautiful, and getting to visit the reindeer halfway through must have been amazing! What adventures have you planned for 2016? 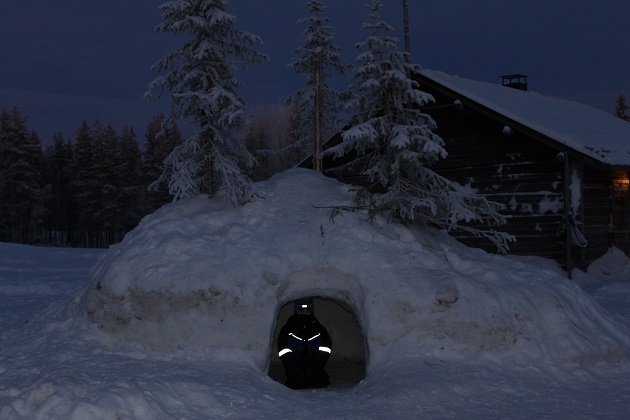 It was incredible – like you say that amazing scenery, the fabulous snowmobile ride and then the reindeer!! We’re still in planning mode, just booked Lisbon for Easter time and Normandy in August, a few other things in the pipeline hopefully!! Wow, what an amazing day! I’ll have to add this to my (ever growing) to do list! It is incredible, an experience like no other – definitely worth a spot on the list!! Oh. My. Goodness. I’m not one for bucket lists, but I’ll create one just for this! It’s a long way from Australia though. Thanks for the great report. It is a very long way but a place like no other – we had the most incredible holiday there, stuffed full of unique experiences, worth the long trip!! You brought that experience to life. I’ll keep it vicarious now that I’m 82. Snowmobilers come to Northern Maine in the winter—an easier way to get around than by car. Thanks for the like. Northern Maine in the winter (or anytime) is somewhere we would love to visit Paula – maybe someday and maybe we’ll snowmobile there!! I had (and have) exactly the same problem Rosemary – the cause of many a bit of bickering in the car!! However he couldn’t hear me yelling to slow down so I was left with no other option but to hold on tight and try to make the most of it!! Enjoy your weekend too. Yes I know the bickering in the car feeling well Joy! Monsieur always has to be “reminded” to slow down and switches lanes very rapidly on the freeway to try and get ahead of the traffic, which can get a tad stressful!! It was so cold but such a lot of fun!! That looks like SO much fun!! I can’t wait to try it one day! It is fun and a real thrill, definitely an experience to remember. Did you enjoyed the snowmobile ? I have quite a traumatic experience of this as our snowmobile felt on its side when we did it haha 😀 It’s harder than it seems ! I remember in France once we saw that happening and it actually fell over a hill. I was freaked out for sure, especially since my husband wouldn’t slow down!! This time was much better though, a more controlled experience!! Very cold but such great fun you hardly notice the icy temperatures. Wow, such dreamy scenery. Memorable, I’m sure! We all really enjoyed this way of exploring that wintery wonderland! !